Scate, I am nearly incapable of leaving a recipe alone, especially when it's a flavor group I feel familiar with. Asian-style recipes I tend to try as written the first time, because I'm less comfy with those flavors, and things-to-be-canned because messing with pH could be dangerous. But pasta with cauliflower? That I can handle. This sounds really fantastic. 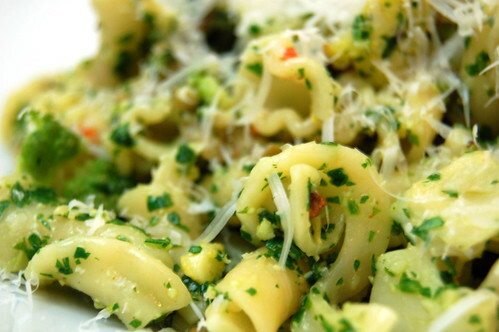 I bet it would be great with basil instead of parsley too... like a real pesto sauce. This has inspired me to buy cauliflower. I love it but I cook with it so rarely! My boyfriend and I have decided to eat meat less frequently. Mostly for health reasons. I don't find it that difficult because I love vegetables and he has been learning to love more vegetables with me. When I do make meat it's usually in something that we'll eat for a couple of days or something that can get frozen for later use. Ooooh, sounds fantastic. GREAT call to roast the cauliflower. I'm going to try this soon. Hey, how did you find your recipe for Gourmet, unbound? I found that if I specified "vegetarian" as one of the search terms on Epicurious it was only giving me recipes back to 1995 or so. I thought it would be fun to pull something from really deep in the archives, but I didn't have time to wade through all the meat recipes! This looks wonderful - and green and bright, perfect for midwinter. 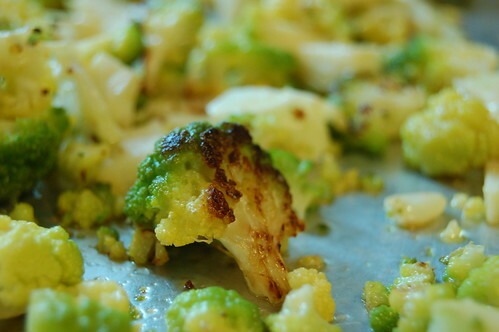 Roasted cauliflower is so tasty, it probably was even better than with the steamed version. And I love cauloflower with pasta. I'm going to have to try this one! Thanks! 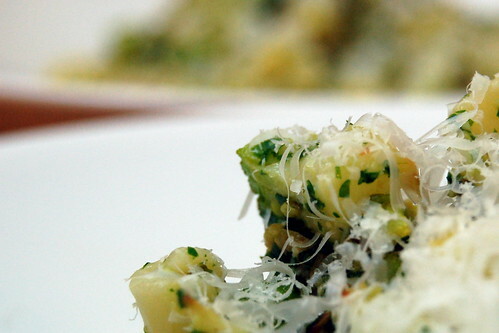 Good Day to you Adrienne, Thanks for sharing the recipe for this pasta food.